With $15.6 million dollars at the box office on opening weekend, “Little” fills the theater with laughs while teaching a valuable lesson of loving yourself. The film depicts Jordan Sanders, a strong, independent, and successful black woman, waking up in her teenage body after a day of being disrespectful to her employees. Her stoic assistant April Williams, played by Issa Rae, helps Sanders navigate through her unfortunate situation. Thirteen-year-old Sanders is played by Marsai Martin, better known for her role as Diane in “Black-ish.” The young actress does an amazing job portraying a 30-year-old in a middle schooler’s body. Throughout the movie, the audience learns to sympathize with Sanders while holding her accountable for her rude interactions with the people around her. The chemistry between Martin and Rae on-screen was so ludicrous to watch, you could see a friendship slowly grow between the pair. From the seemingly endless arguments to their duet of Mary J. Blige’s “I’m Goin’ Down,” you start to fall in love with their dynamic. “Little” was quite an entertaining film filled with jokes and silly moments. It’s clear why it climbed to second in the box office immediately, just behind Warner Bros.’ “Shazam!” upon its debut on April 12. However, even though the movie is profitable, it just isn’t that memorable. If it weren’t for the perfect casting of Martin and Rae, the movie may not have been as enjoyable as it was. The amusement the audience has while watching the film is due to the duo, not the actual storyline. Martin is such likeable actress and portrays young Sanders in an amazing way where you really believe there’s a 30-year-old woman stuck in a child’s body. Her acting is just so great that the lack of a strong script is easily forgotten. The young actress, as well as Rae, truly makes the film worth the watch. Lexy Vagasy, senior, rehearses her solo for the Florida State Thespian Festival competition to be held March 20-23 in Tampa. She performed this solo at districts in December and got superb comments from the judges. “I love seeing the reactions of people I perform in front of, especially when I reach my high notes,” Vagasy says. Senior Jessica Romer sings with her group mates in her rehearsal for the Florida State Thespian Festival, held March 20-23 in Tampa. She used passion and spirit hoping to “wow” the judges with not just her singing, but with her emotions as well. “I love to perform and create for the benefit for other people,” Romer said. The final host family meeting for the International Summit was held on Jan. 11 where attendees learned who they would be hosting and were made aware of their responsibilities. Senior Georgia Brown will be receiving two Irish girls from St. Raphaela’s Secondary School. Brown and other host families will be receiving their exchange students on Jan. 25. Dropping in March, this show follows four best friends going into freshman year while also tackling love, a new school, family drama and other normal teenage problems. Unlike other coming-of-age shows or movies, the show is almost entirely made up of people of color, takes place in a poor and violent neighborhood in southern Los Angeles and deals with real-life issues facing black and hispanic teenagers every day like gang violence, deportation and just trying to make it to the next day. Everything about this show is real and authentic: the acting, the pacing but especially the writing because it doesn’t sound like a bunch of white writers trying to cater to the black and hispanic community but not having a clue as to who we are as actual human beings. As a black girl, this show gives me the representation that my race (along with others) has so desperately been needing without portraying us as stereotypical or as a joke. The Good Place is a sitcom unlike any other. Centered around recently deceased Eleanor Shellstrop, the show begins with Eleanor being told she’s dead, and it only gets more intriguing from there. Not only is that beginning something unheard of for a comedy, but the ways in which death and the afterlife are discussed is done in a tasteful way that is simultaneously entertaining and unoffensive, which is sometimes hard to find. When telling such a complex story, other areas may suffer, but with this show, that’s not the case at all: the writing is fantastic, the acting is amazing, and the story itself flows perfectly across the three seasons that have been released. I’ve personally watched the show three times in the last year since my first watch, and each time has been more entertaining than the previous. The show’s cleverness makes it entirely worth the watch, and you may even learn something about ethics without meaning to. Airing on Spanish network Antena 3 in 2017 and then being acquired by Netflix, this show is about a man named The Professor planning the biggest bank heist in the world and recruiting eight people to pull it off. As always, no heist goes perfectly according to plan and those problems are seen playing out (and blowing up) on screen around the characters. This show cleverly balances nine main characters and their various relationships in and out of the group without neglecting the main point of the show: the heist. Besides being entirely in Spanish, the show is unique because at the same time that the crew is pulling off the heist, it shows the Professor preparing them for the heist and has one of the main characters narrating both points of view from some point in the distant future; much like the show How to Get Away with Murder. The writing never gets messy and nonsensical, like one would expect, but gets more intricate and interesting. Superstore follows the lives of employees at a “supersized megastore,” and the ups and downs that comes with working there. Not only is the show hilarious, but it also discusses important topics, like immigration, in ways that show the people involved as they are: real people that are not defined by their struggles. The show contains a diverse cast, but that diversity is not the point of the show, and that diversity is never made to be a joke as it may be in lesser shows. The writing makes the show seem effortlessly funny, and it’s incredibly easy to watch whole seasons at a time without even realizing that you’ve done it. The characters are relatable enough that you can see yourself in at least one of them, if not all. Airing on go90 in 2016 and being picked up Hulu after go90 shut down, this show centers around three girls who are tagged in a video showing the murder of a girl, among other violent videos, and they have to figure out who tagged them before time runs out. Along with being a typical teenage show, it also takes invasion of privacy to the extreme and depicts what could happen if your social media profiles fall into the wrong hands. Given, there are a few storylines that don’t really fit, but the show’s intensity and realistic teenage messiness makes up for it. Unlike other shows, you find out everything at the same time the characters do and feel everything the characters do but only you have the luxury to pause whenever you please. It’s like a better version of the show Pretty Little Liars, with none of the unnecessary build up and unsatisfying payoff. Despite being much older than the other shows on this list, That ‘70s Show has rightfully earned its place on the list by being a go-to rewatch show. The show, covering the whole of the 1970s, tells the story of a group of friends beginning in high school and following them into adulthood, despite their many attempts to hold onto their fleeting childhoods. Despite having began production in the ‘90s, the show portrays the time period it’s written in well, and does so without seeming like it’s making a mockery of the time period. Each character on the show is written differently, and the differences between the characters complement each other nicely. After watching the show’s eight seasons, the Foreman home feels like a second home to me, and if you watch the show, it’s likely that you’ll feel the same. Mr. Pompano, originally set to be held on Dec. 6 has been moved to Feb. 18 due to availability issues. Ms. Coronado has gone on vacation, so she can’t cover the tech necessary behind the show, and the show can’t be held during the International Summit in Jan., so Feb. is the earliest available time. Participants have opted to make light of the reschedule, using the time to further practice their acts. “I wasn’t expecting it, but now I have more time to work out and get my act ready,” senior Kaelib Measil said. Junior Alexis Suarez is given her blanket of appreciation post blood donation. This will be her third time giving blood. Students got into the holiday spirit by giving the most precious gift of all; blood. JROTC participants assisted the One Blood staff by helping prepare students for the procedure. They gave out snacks and helped students sign in. 12 students were able to give blood. This opportunity to save lives will return tomorrow and again next quarter. Students must have a completed permission form and healthy vitals on the day of donation. Fantastic Beasts: The Crimes of Grindelwald, the sequel to Fantastic Beasts and Where to Find Them, came out in theatres Nov. 16, and while the movie made $62 million at the box office in its opening weekend, it hardly lived up to the expectations set by the first film in the Harry Potter spin-off series. Since the moment the first trailer had been released, I’d been wary of the movie due to its reliance on so many different characters with so many seemingly separate plots that, while designed to tie together at the end, failed to do so. The first movie in the series, much like the series it originated from, focuses on only a few characters and their stories merge elegantly, ending in the standard battle sequence and bittersweet closing scenes we’ve come to associate with movies in the Harry Potter universe. This sequel, though, switches between stories with weak links to each other that don’t fit into the set story J.K. Rowling herself created over twenty years ago. If the whole plot had been the rising tensions during Grindelwald’s attempted rise to power, it would’ve made sense. However, Grindelwald wasn’t even in the top five main characters (not that I’m that disappointed because of the poor casting for the character, but I digress). Newt Scamander was still one of the main protagonists, despite his story having been wrapped up nicely in the previous movie, but this time, his main goal was gaining the affection of Tina Goldstein, the woman he left behind in the previous movie. The Harry Potter franchise has always had its fair share of romance, but to make romance such a big plot point in a movie about wizards in the middle of preventing an actual war is pointless. There’s so much more that can be done instead, and making Scamander chase Goldstein to Paris, and even shoehorning an awkward exchange between the two into what should’ve been an important scene relating to the actual plot, is just lazy writing. The movie was messy overall, and really, it was rather boring. You can only sit through a movie with a too-dense plot for so long before you’re checking the time and guessing at how much longer before the movie will end, and I spent the last half hour doing so. Seniors and their parents gathered in Tornado Alley on Oct. 9 t for Financial Aid Night to receive assistance with filling out financial aid applications.The attendees were told to bring their W-2 forms and any other forms they needed in order for the guidance department to provide personalized assistance to each family. Ms.McFadden is available in her office within the guidance department for students to come to her with questions or problems. Red Ribbon Week, an event dedicated to bringing awareness to drug and alcohol abuse, was held from Oct. 22- Nov. 1. Peer counseling organised a spirit week, held events during lunch and hung up posters around the school for the event. Peer counseling teacher Lafaris Dooling, who has organized Red Ribbon Week for the past four years, says “we do have a huge problem with our kids and using, not only drugs, but alcohol as well”. Students are largely supportive of the week. Drug abuse is something students often overlook, and Red Ribbon Week attempts to bring light to the issue. Red Ribbon Week strives to “bring awareness to things teenagers are going through on an everyday basis,” Dooling says. Some students hope the event is taken more seriously. Peer counseling was happy with how Red Ribbon Week turned out, and it was seen as very successful. “It really educated teenagers,” said Hurst. SGA announced the winners of the freshman elections that had been ongoing for several weeks during the pep rally on Sept. 27. The winners are Yolisabel Perez for president, Aashi Chhabra for vice president, Sydney Rodriguez for secretary and Fernanda Andino for treasurer. Rodriguez also shared a goal for the year. “I want to make the freshman class more spirited,” Rodriguez said. Senior Kylie Severine poses in her senior colors. Since its her last homecoming spirit week, she decided to go all out. Juniors Alexa Salazar and Malaika Williams pose before their third homecoming pep rally. “I can’t believe that at the next pep rally we’ll be wearing gold,” Salazar said. Sophomores Jace Alexander and Keiarah Williams show off their costumes as Kanye West and Lil Pump in the music video for the song “I Love It.” Alexander and Williams are known throughout the school for their larger than life outfits for spirit weeks. Senior Mikaela Whitmer and Junior Lilly Jones dress as members of the A&E TV show “Duck Dynasty.” “We knew nobody else would do it and it would stand out.” Whitmer said. Junior Alyssa Wild poses for the second day of Spirit Week. She dressed up as someone from the 80s. Juniors Jackson Pace, Christian Torres and Michael Raszka pose for the second day of Spirit Week. They dressed as ancient Romans. Junior Brianna Caffro poses for the second day of Spirit Week. She dressed up as someone from the 70s. 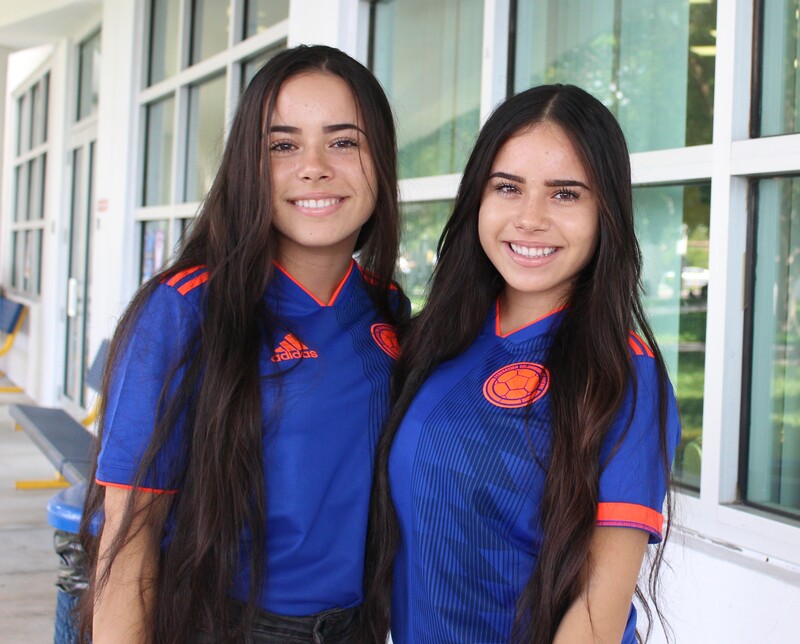 Juniors Andrea and Angela Ventura match in their favorite jerseys for the first day of Spirit Week. They’re both representing Selección de fútbol de Colombia. Ms. Spencer, Ms. Carlson and Mrs. Samaroo represent their favorite teams for the first day of Spirit Week. They’re representing the Gators, the Marlins and the West. Seniors Ashleigh Livesay, Jaya Neysmith, Elise Llornes, Katie Stept, Gabriella Costello and Claire Ries pose in their favorite sports teams’ jersey for the first day of Spirit Week. They’re representing the Utah Jazz, the Celtics, the Steelers, the Marlins and the Heat. Teen Summit, also known as the Peer Counseling Summit, was held Sept. 14 in the auditorium bringing together peer counselors from middle and high schools across the county to bring awareness to normal teen issues. “It is important because it helps the peer counselors learn skills that can be used to help the students,” peer counseling teacher Lafaris Dooling said. The summit began with a meditation presentation before splitting up into breakout sessions which went over programs that the schools should implement. “We brainstormed different ice breakers and events to plan so that no one at school feels alone,” senior Paris King said. One of the programs was Sandy Hook Promise, which encourages students to notice those isolated and “just say hello.” Another program is the Courageous Conversation, which is meant to get students to start talking about issues that normally aren’t talked about, like suicide and mental illness. The summit also urged schools to implement the HOPE program, which is already a club at our school that is meant to help students overcome problems and helps with suicide prevention. The summit also wants schools to implement Blueapple Poetry, a network founded by the Jason Taylor Foundation that shows students how to express themselves through poetry. “It’s important because it teaches people how to cope with things and it goes over a lot of issues teens go through today,” King said. Freshman Breah Campbell readies herself for the presentation of flags. Sophomore Alfonse Mazzarella poses for his school photo in the auditorium Aug. 29. This photo was be used on his school ID. School photos took place in the auditorium for the first time this past Wednesday and Thursday, Aug. 29 and 30. “[In the past] Fox-Mar had to break down their equipment and set up again after the first day because of sports,” current yearbook advisor Dr. Andrew Shipe said. Fox-Mar employees also added that the gym is very open and harder to keep the students in one place. However, by using the auditorium instead of the gym, there is less space available to take photos. “It will be a little tight,” Shipe said. This year, the school distributed lanyards free of charge in addition to hole punching the ID cards. The school began enforcing the wearing of IDs on Sept. 4. Photo retake day will be on Oct. 2.